SHARP is all set for the launch of AQUOS S3 smartphone on March 28th, 2018 in Vietnam. 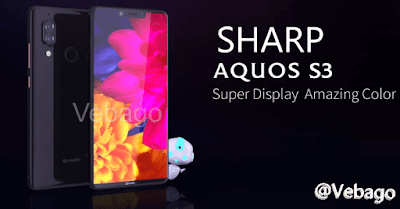 The SHARP AQUOS S3 device is highlighted with its notch design and a 12MP + 13MP dual rear camera. It is rumoured that the device will run on Android 8.0 (Oreo) OS and is powered by an Octa-Core Snapdragon 660 processor with Adreno 512 GPU. The device is expected to come with a 6-inch Full HD+ LCD display with a 2280×1080 pixels resolution and a 2.5D Corning Gorilla Glass protection. The Hybrid Dual SIM (nano + nano/microSD) will come with a Fingerprint sensor, a face scanner feature that unlocks the device in 0.1 seconds, and it measures 148×74×7.98mm and Weighs 157.4g. The smartphone comes with a 2930mAh battery with a Quick Charge 3.0. There is a 12MP rear camera with f/1.75 aperture, dual-tone LED Flash, PDAF, a secondary 13MP camera for capturing the memories and a 16MP front-facing shooter for video calling and selfies. The SHARP AQUOS S3 sports a 6GB of RAM with 128GB of inbuilt storage and a 4GB of RAM with 64GB of inbuilt storage. Both variants can be expandable up to 256GB via a microSD card. Connectivity options on the SHARP AQUOS S3 smartphone include 4G VoLTE, WiFi 802.11 ac, Bluetooth v5, GPS + GLONASS, and a USB Type-C.